Hi, I am interested in your 1965 Shelby Cobra-Replica listed on Autotrader for $45,000. I'd like to get more information about this vehicle and confirm its availability. 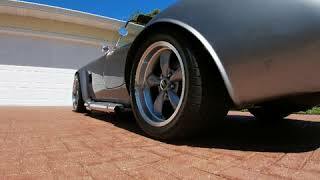 Absolutely perfect and stunning Factory Five Racing Shelby Cobra MK4 for sale. Custom built by Gordon Levy Racing of Maricopa AZ and delivered to me in in Florida in November, 2015. Gordon Levy is a renowned SCCA champion and specialty Cobra fabricator. He is a well respected subject matter expert on all of the Cobra forums and his team has hand built over 250 FFR Cobras to date. His cars are exceptional. I am not a mechanic by any stretch. When I sat down with Gordon to discuss the build, I told him that I wanted a car that went fast, stopped quick, was daily-driver reliable, and looked and sounded amazing doing it. They delivered in spades. The car is palladium silver with ghost stripes over a black interior. I wanted a super clean, light design -- no unnecessary extras (no stereo, no wipers, no cup holders, no A/C, etc.) I had the dual roll bars installed in case I wanted to do some instructor-led track time, but that never happened. The car has never been raced or autocrossed. This car was hand built from the ground up with no donor parts. Here is what I know about the internals and I know Levy Racing would be happy to take your call to discuss the finer details. My understanding is the motor was beefed up internally so that adding horsepower would be very straightforward. The car is super powerful yet a very manageable and balanced street performer. Some recent health changes are requiring the sale. The car has approximately 4,500 miles on it, always garage stored, has never seen rain, no scratches or blemishes etc. Perfect running shape. My ask is $45K or best offer. Car is located in southwest Florida and I am sure we could work out shipping if needed. Finished, titled in Florida as 1965.